State of conservation: excellent, with the exception of three wax cups (bobèches) which have been replaced. The triangular plinth is composed of a foundation with concave sides surmounted by a similarly configured base decorated with protomes of winged lions and Persian palm motifs. Above this, a sheaf of acanthus leaves wraps the base of a fluted column that tapers slightly upwards to a capital, which reproduces the acanthus leaf decoration. A calyx stands atop the capital and supports the first order of arms, which alternate with extended palm leaves and are adorned with twining acanthus shoots. Each candle holder is decorated with palm leaves and has a wax cup or bobéche. The second order of arms continues the same decorative motif. The model for these candelabra, characterized by shafts enwreathed in palm leaves and an animal-claw base, draws inspiration partly from ancient marbles and also from early 19th-century drawings by Charles Percier. A later variant, crafted by the famous French bronze-smith Pierre-Philippe Thomire and placed in the State Apartments of the Grand Trianon in April 1837, is described as une paire de Candelabres [...] sur pieds à griffes [a pair of candelabra with animal-claw feet]. If we compare our exemplars with other candelabra from the same period found in the principal European courts and noble palaces, we find a large number of variations on the theme. 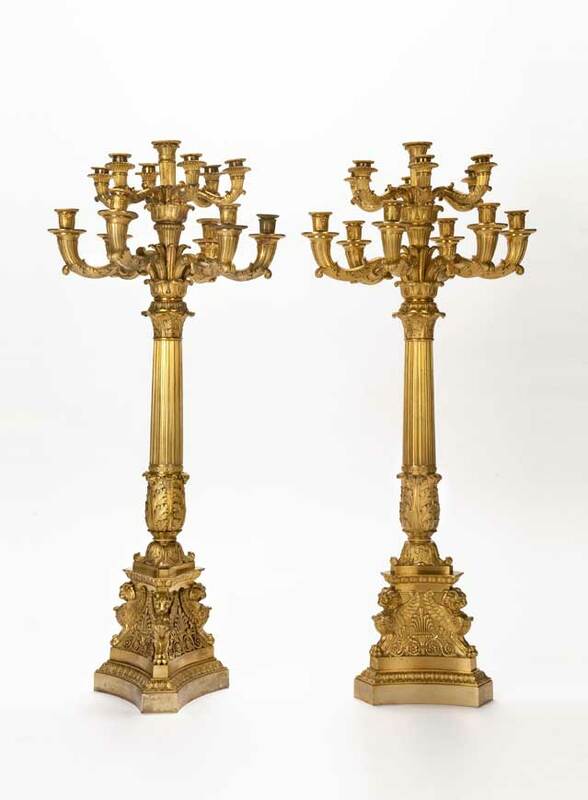 On the basis of the style, technique and taste, it is reasonable to suppose that these important candelabra are the work of French or Russian artisans working in the second quarter of the 19th century. Sculpture in gilt bronze, ivory, iron and granite. 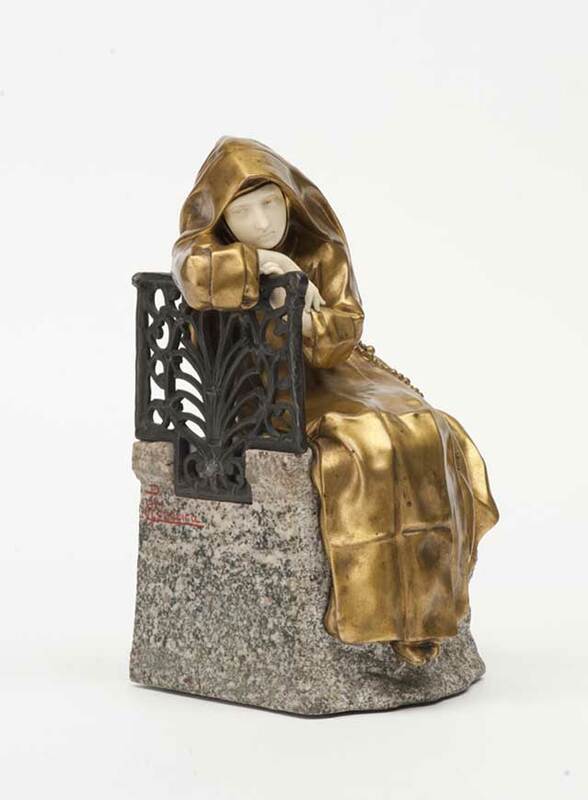 Canonica’s nun, crafted in gilt bronze with hands and face in ivory, is leaning against a wrought iron backrest apparently lost in wistful dreams. The subject is at once humorous and moving. 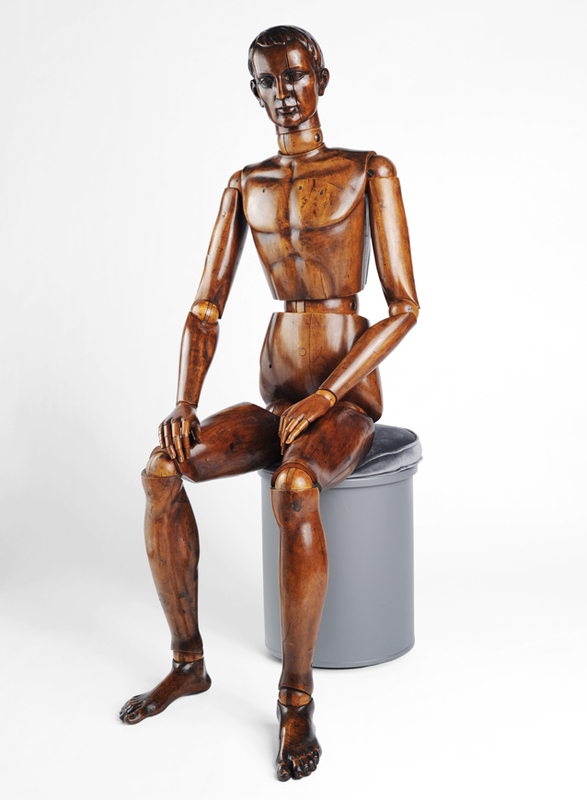 She is very modern in her informal attitude and twisting pose, which the sculptor conveys via the heavy folds of her habit. It is probable that this replica of the original After the Vows, a bronze exhibited at the Paris Salon of 1893, was crafted in the 1920s or ‘30s, as can be supposed from the use of materials typical of chryselephantine sculpture in the Art Deco period. As Vicario writes, the sculpture portrays a nun “sighing over the earthly joys she has renounced by taking her vows”. Much acclaimed at the Salon, the original was purchased by the artist and art dealer Adolphe Goupil and won Canonica, who was only 24 years old at the time, an honorable mention. The artist went on to become one of the most important and successful Italian sculptors of his generation. After completing his education at the Accademia Albertina of Turin under the guidance of the sculptor Odoardo Tabacchi (from 1881), he opened his own studio. Canonica’s fame grew and his prodigious talent was put to work on monuments in Rome, Saint Petersburg, Istanbul and Baghdad. He was one of fashionable society’s most sought-after artists, creating portraits of famous artists, politicians, and royalty throughout Europe; his portraits of the British royal family were exhibited at the Royal Academy in 1904. The sculptor finally settled in Rome, where he became director of the Academy of Fine Arts. After his death, his house was transformed into the current Museo Canonica, where many of his works are now kept. Base in turned and ebonized wood; upper portion in wood and pressed paperboard, partially covered with printed paper; some fittings are made of iron. Louis-Charles Desnos (1725-1791), engineer and geographer, lived and worked in Paris. He defined himself not only as a "marchand libraire" but also as “Ingénieur-géographe de la Ville de Paris et du Roi de Danemark”. Indeed, he was paid each year to send copious quantities of atlases, globes, and maps to Christian VII of Denmark. 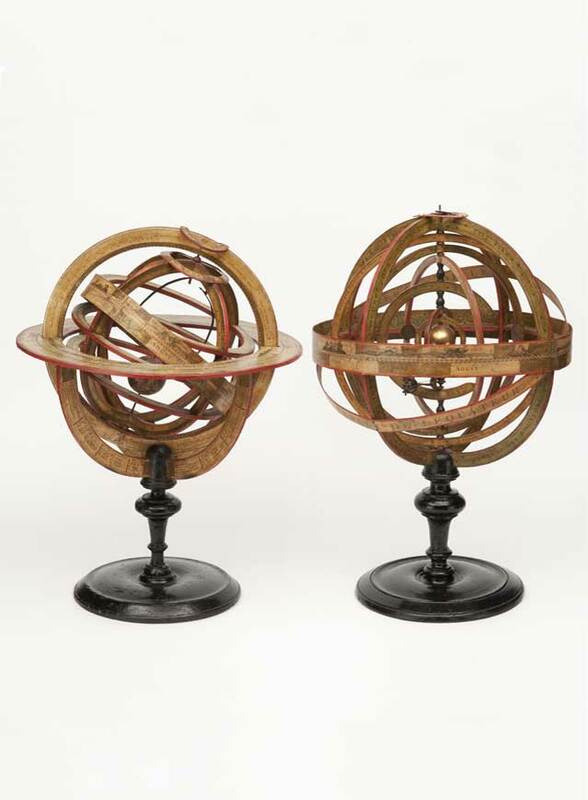 There is no doubt that Desnos played a preeminent role among globe-makers in mid-18th century France. A close friend of Didier Robert de Vaugondy (1723-1786), he joined the ranks of globe makers and publishers in 1749 when he married Marie-Charlotte Loye, widow of Nicolas Hardy (ante 1717-1744), who had established a globe-making workshop in 1738 which she ran with her father. Desnos continued the Hardy’s publishing business, progressively expanding its portfolio, helped by the engraver Jean-Baptiste Nolin the Younger (1686-1762), Giovanni Antonio Rizzi Zannoni (1736-1814), and Louis Brion de la Tour (1756-1823). He conducted business in the Hardy’s workshop on Rue St Julien le Pauvre until 1757, when he moved his shop to Rue Saint-Jacques. The two mirrors have narrow, rectangular frames decorated with a garland of globular roses with small rounded petals. The upper corners of the frames are embellished with bouquets of these blossoms. The ornamental element at the top is surmounted by a princely crown and contains at its center, within scroll-like brackets, a coat-of-arms representing a spread eagle with its head turned to the right. Although the original colors have been lost and cannot assist us in identifying the coat-of-arms, it is quite probably that of the Labia family of Venice. The heraldic insignia anchors a fluttering ribbon and is framed by roses. At the bottom of the frame, a luxuriant bouquet stands in symmetry with the coat-of-arms and is also embellished with wind-blown ribbons. A delicate, twin candle holder extends from its center. Some traces of color may still be found on the leaves and petals of the decorations. On the basis of style, we may date the two mirrors to c. 1780. It appears reasonable to surmise that the mirrors were inspired by German or Austrian works, especially on the basis of comparisons with other works from the same period, such as the large lantern in Brüel Castle. 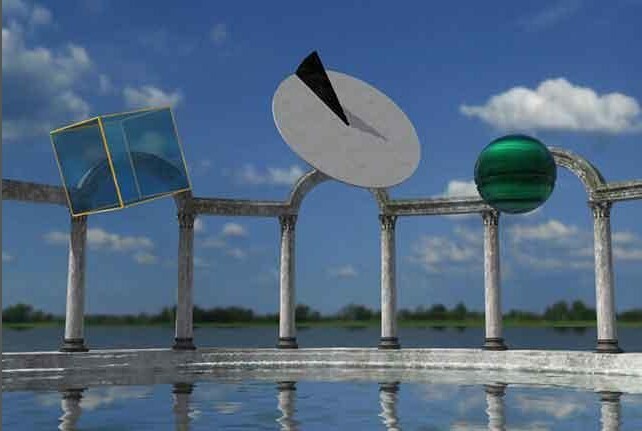 ìThe attribution of the coat-of-arms to the Labia family leads us to presume that the workshop where the mirrors were crafted was located in the Veneto, or perhaps even in Venice itself. Regarding technique, we might take as an example the four-footed brazier attributed to a Veneto workshop from the first half of the 18th century and decorated with floral swaths (now in the Tolentino collection in Florence), in spite of its somewhat coarser features, not having been intended for the same decorative prominence as the mirrors. In conclusion, although some suggestion of the Baroque may be discerned, with the possibility of Alemannic influences, we may venture a date for these two mirrors to the period after the construction of the "new" Palazzo Labia had been completed and attention had turned to decorating and embellishing it. This marked a time when the family was being fully accepted into the Venetian noble ranks, in spite of the initial economic difficulties that would eventually lead to its decline. Indeed, after the 1740s, the palazzo was famous and celebrated in the paintings of the preeminent veduta painters. In the 19th century, the family’s economic downfall was inevitably followed by the abandonment of their impressive Venetian mansion, which was finally stripped bare in 1852. 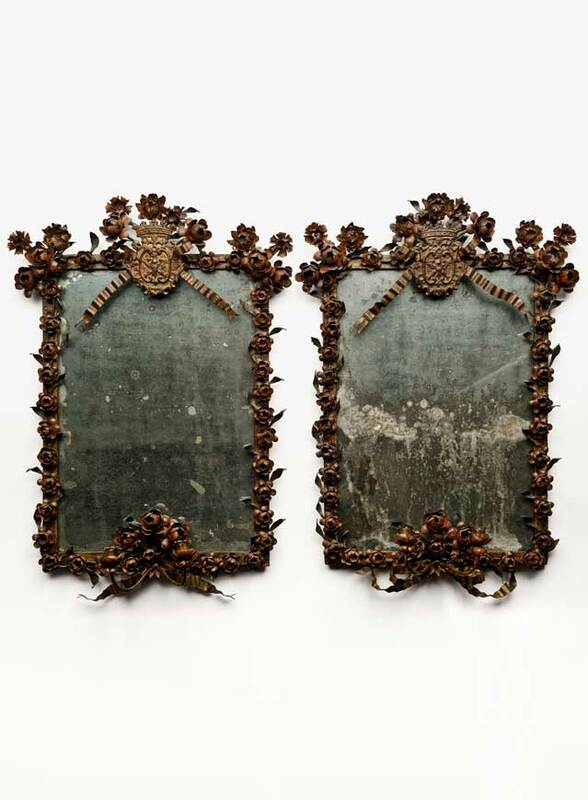 The mirrors were not included in the catalogue of the famous Beistegui Auction of 1964 because they had probably already been sold on the market. This work of extraordinary structural and decorative complexity comprises, in a succession of orders, a temple with a square-plan surmounted by a temple with a round plan topped by a dome and lantern. The tabernacle stands on a square base supported by four fantastic hippocampi with outspread wings and a long eel-like tail terminating in an open-mouthed dog’s head. The base is delimited at the bottom by a band bearing a dedicatory inscription “DEO MAXIMO DICATUM BONUS COMES q. ARGENTI Dc BONIS COMITIBUS DA CAMERINO DEO GRATIAS FACIEBAT ANNO D.M.I. MDLIIII” (Dedicated to Almighty God, Bonconte son of the late Argento de’ Bonconti da Camerino crafted by the grace of God in the year of the Lord 1554). The base supports the first structural order of the elaborate tabernacle. It is a templet with a square floor plan and a portal on every side, standing upon a three-stepped platform delimited by corner pedestals surmounted by four angels. Twenty-four medallions in silver leaf bearing embossed inscriptions alluding to the Eucharistic mystery are arranged around the base of the templet. Each side has a small door with silver openwork decorations flanked by columns supporting an entablature strip with evangelical inscriptions. A porch stands before each door composed of columns and a tympanum with God the Father and angels holding the symbols of the Passion. One of the sides opens to accommodate the consecrated host. A second small temple atop the first features a circular floor plan but a square base delimited by a balustrade with two openwork sides. Four small full-relief statues stand on pedestals at the corners of the balustrade: the Virgin of the Annunciation, to whom is dedicated the Camerino Cathedral; San Venanzio, patron saint of Camerino, holding an image of the city in his hands; a figure in priestly garb, perhaps Sant’Ansovino or a prophet; and a fourth figure in classical vestments, with a cape billowing in the wind and an open book in his hand. The temple is surrounded by twelve fluted columns standing on a low stylobate faced in silver and decorated with ram’s heads separated by metopes. The walls of the temple are adorned with pilaster strips alternating with niches accommodating the twelve statues of the Apostles on corbels. The columns support a round base ringed by another balustrade with volutes supporting the four seated Evangelists. Each is writing in a volume and accompanied by his symbolic figure—the eagle, the lion, the bull and the angel—holding an inkpot. The balustrade surrounds a high tambour with a series of windows alternating with herms and embellished with tiny enamel-filled incisions mimicking stained glass. The dome above is completely covered with square ashlars diminishing in size upwards, each culminating in a rosette and separated from the others with silver bosses at its corners. A rather unusual sculpture, crafted during a later period, stands at the top on a lantern. It is a winged female figure in flowing robes standing on a sphere and bearing a palm leaf and a crown: she may be Victory or Fortuna. The tabernacle was originally located in the old Cathedral of Camerino in the chapel dedicated to the Most Blessed Sacrament, in keeping with the liturgical dictates of the Council of Trent in reaction to the precepts of the Reformation. We have documentation of it dating to c. 1726 and we know that the large tabernacle was still found in Camerino in 1836. A few years later, in 1842, it was sold by the Chapter Priests for 80 scudi. The object was then lost until 1959, when it was displayed and published on the occasion of the exhibition Argenti italiani dal XVI al XVIII secolo in Milan at the Museo Poldi Pezzoli. The tabernacle was again forgotten for decades and only recently rediscovered. The definitive study and scientific publication by Benedetta Montevecchi, following restoration of the work by the Morigi workshop in Bologna, also clarified the proper attribution of the Tabernacle to “Bonus Comes q. Argenti de Bonis Comitibus de Camerino”, i.e., Bonconte, son of the late Argento de’ Bonconti da Camerino, providing also a compelling hypothesis of the origins of the goldsmith himself. We have no documentation of a family by the name of Bonconti ever living in Camerino. 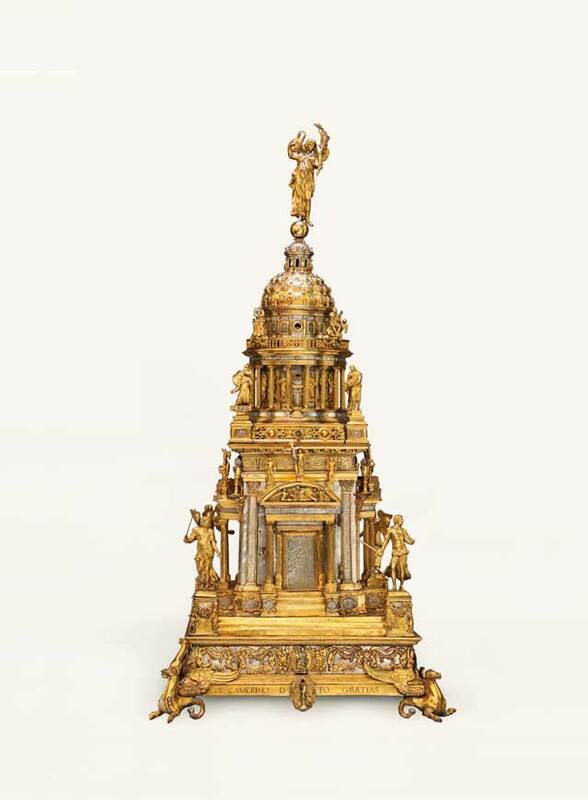 The variety of cultural references incorporated into the tabernacle, substantially distant from the goldwork of Bonconte’s contemporaries in The Marches, and its monumental structure appear to draw their inspiration from Lombardy’s fanciful Renaissance architecture. The complexity of the structure and the incredible richness and variety of its decorative elements also suggest a work involving the contribution of more than one craftsman under the supervision of Bonconte. It was his hand that added the dedication and proudly signed the work in numerous points with the initials “BC”. The only currently known piece that may be compared to it is the large Peace in the Vigevano Cathedral, a complex work probably dating to the late fifteenth century and reworked in the early decades of the following. Unfortunately, the impossibility of comparing the tabernacle with other works by Bonconte allows us to venture no more than hypotheses, although they are well supported by the notable stylistic similarities between the two objects. These elements suggest that the artist obtained his early training in the Lombardy-Veneto region. For a thorough interpretation of the tabernacle complete with bibliographical and archival references, the reader is referred to the careful study carried out by Benedetta Montevecchi. MONTEVECCHI B. in Morello G.(ed. ), Alla Mensa del Signore, capolavori dell’arte europea da Raffaello a Tiepolo, exhibition catalogue, Ancona, Mole Vanvitelliana, 2 settembre 2011 - 8 gennaio 2012, pp. 220-221, no. 75 and associated bibliography. Built of oak completely finished in bois de rose veneer, the stand is composed of a rectangular top supported on an octagonal column with tripod feet on casters. 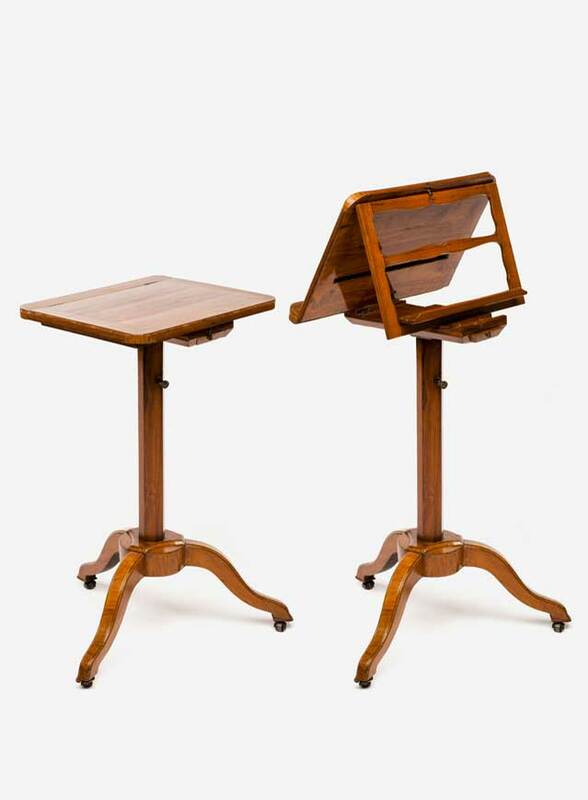 By means of rather complex mechanisms, it is possible to increase the height by half, tilt the top and transform it into a two-sided lectern/music stand with adjustable inclination. We have little biographical information about Nicolas Grevenich: he was probably born in the Rhine area of Germany but lived and worked almost his whole life in Paris, where he was named maître in 1768. Documentary sources reveal that he was still receiving important commissions form the royal Garde-meuble in 1791, especially for the Tuileries Palace. His workshop was still active during the Empire period. The rectangular table features a minimally overhanging top with an “owl’s beak” edge. The decoration is symmetrical over the entire surface and consists of an alternation of geometric and plant motifs centered around a hexagon in a three-banded frame enclosing a complex floral design. The corners of the top are embellished with multi-petal flowers. The linear fascia is decorated with a simple motif using chiaroscuro effects achieved by combining oblique or vertical wood grains in linear frames. The square-section legs taper downwards and culminate at the top in a square capital where the multi-petal flower decoration is repeated. The legs have a narrow section just under the capital embellished with a faux fluting design. The legs are decorated with the same chiaroscuro effect as seen on the fascia. There is one drawer on each of three sides. The table also contains numerous secret compartments opening via spring-loaded mechanisms. The front drawer contains a slide-out writing surface bearing an inscription in India ink on its underside: “1796 li 26 . Genajo – Fabri.to – Dalli fratelli Cassina – in Milano” [26 January 1796 – made by the Cassina brothers in Milan]. 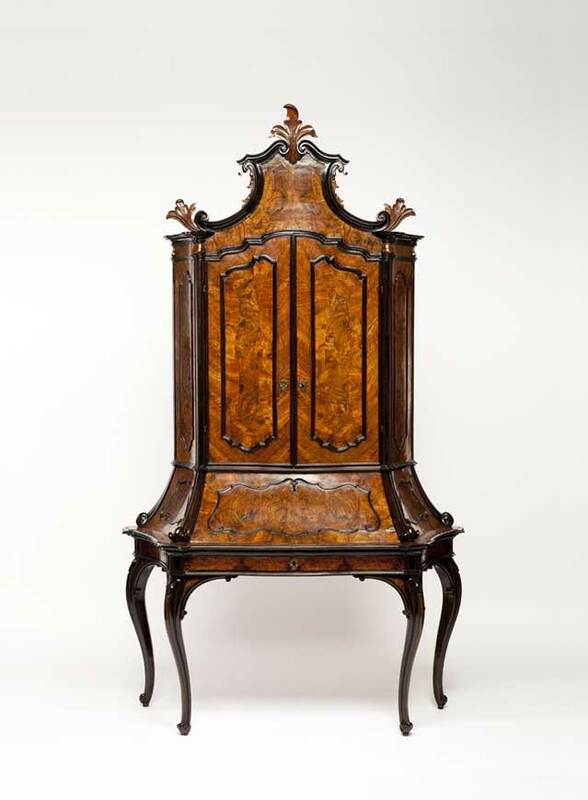 The brothers Francesco and Giuseppe Cassina, both cabinet makers, were originally from Meda but also worked in Milan. Francesco, nicknamed Volpino [little fox], was the more famous of the two. He crafted and signed a desk with a fold-down writing surface veneered in walnut and walnut burl with bois de rose inlay, currently in a private Milanese collection. The underside of the bottom drawer bears an inscription written in pen: “1779, 10 febbraio – Questo buro è stato fabricato di Francesco Cassina in Meda, detto il Volpino” [10 February 1779, This bureau was made by Francesco Cassina “il Volpino” in Meda] (Alberici 1969). In 1793, Giuseppe earned mention from the Società Patriottica di Milano for his inlay work (Beretti 2005). The bureau-cabinet stands on four slender cabriole legs ending in scrolls. The lower part features a full width drawer with a writing surface above it that folds down to reveal a number of smaller drawers. The sides are strongly contoured, while the contours are less accentuated on the front. The lines of the lower part are continued in the sides of the upper section, which is a cabinet with two doors enclosing shelves. The vigorously mixtilinear crown features three applied Rococo ornaments. The desk is almost completely veneered in walnut burl with contrasting ebonized wood trim, edge molding, and cornices. The iron keys and locks are original. This is a characteristic piece of Lombard furniture from the 1750s or '60s. However, while this bureau-cabinet falls into the category known as trumò (trumeau) in 18th-century Milan, it does show a number of unusual traits for Lombardy. These may be seen in the choice by the designer, who was clearly receptive to rococo tastes, to give his work high legs, softly contoured sides, and Rococo decorations at the top. 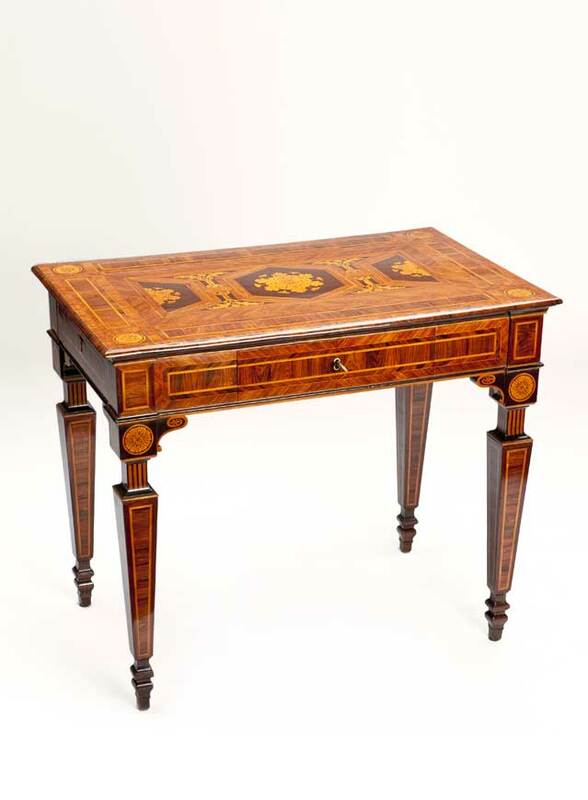 The chromatic combination of walnut burl and ebonized wood, which was much in vogue in Lombardy for nearly the entire 18th century, identifies a late-Baroque style for the bureau-cabinet and helps dispel any doubts as to its provenance. The excellent quality of the wood, the discerning arrangement of the veneer, and the elegance of the architectural design of the volumes and contours prompts us to attribute it to a workshop in the city of Milan, which is where the patrons who were most receptive to the spread of the Rococo style lived and where a good portion of high quality furnishings were commissioned and crafted. 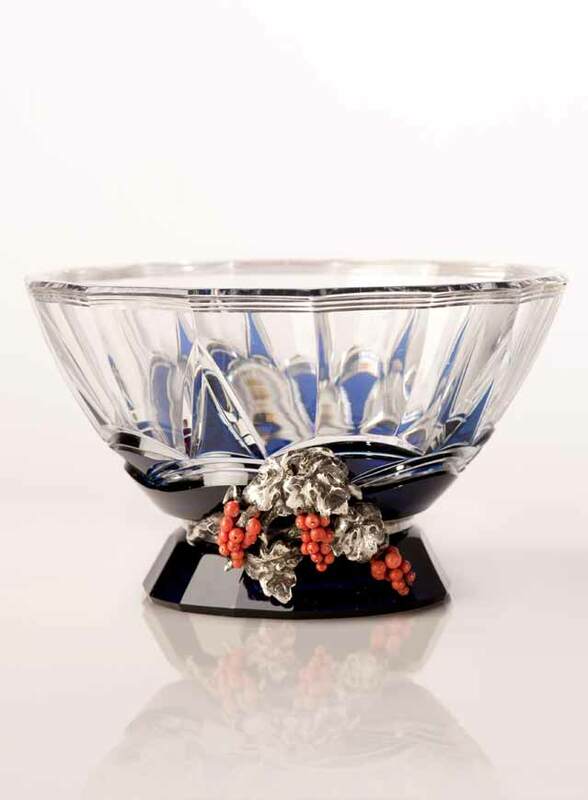 The cup stands on a tapered polygonal foot made of blue crystal with a narrow waist where it joins with the bowl. The bowl itself is crafted in transparent crystal that continues the polygonal motif. The base of the bowl is decorated with a series of engraved blue arches, overlapping somewhat to create a corolla, and by five vertical cusps of the same color. The rim is accented with a triple cut line around the entire circumference. A band of silver representing a currant branch wraps the “waist” where the foot joins the cup with the currants made of orange coral. The silver parts bear the following stamps: a lozenge with the abbreviation of the province (MI); Roman fasces; the number 08, which belong to the goldsmith Eliseo Mangili; and the fineness in parts per thousand (800) without a border. The silversmith’s marks became mandatory with the enactment of Italian Law no. 305 of 5 February 1934, which required the use of a uniform marking system to identify the craftsman. 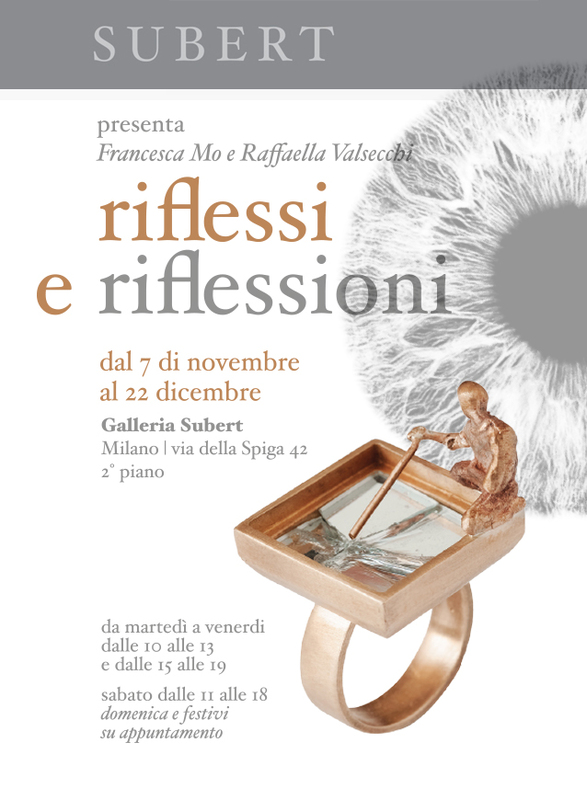 In this case he was a silversmith active in Milan in the period 1935-1949. Eliseo Mangili has been one of the goldsmiths who assisted Alfredo Ravasco (1873-1958) in his activity until 1920s when he undertook his own activity. 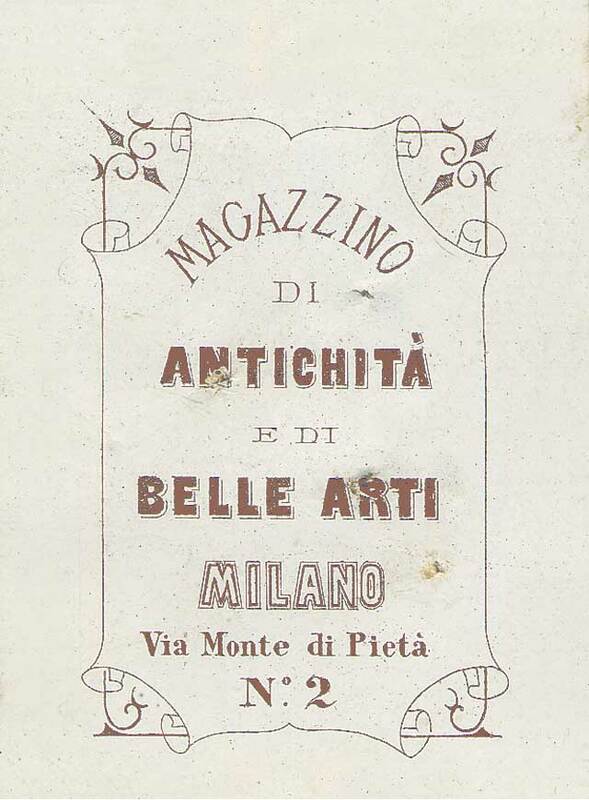 In 1860, with Italian unification on the horizon, Emanuele Subert (1830-1888) opened his first antiques gallery in Milan in Via Monte di Pietà 2 with the name Emanuele Subert Antichità e Belle Arti. Of Polish origins, Emanuele moved to Milan with his family from Trieste, the birthplace of his wife, Elisa Berger (1832 - post 1900), after also having lived for some time in Vienna. He opened a number of other stores in Milan over the course of some twenty years. Bibliographical and documentary sources report that Emanuele Subert was a supplier for numerous museums and collectors, notable among them Frederick Stibbert, in Florence, and the nascent Museo Poldi Pezzoli, of the Consulta del Museo Patrio Archeologico and the Bagatti Valsecchi brothers, in Milan (Probst 2004). In keeping with the demands of the market at the time, Emanuele’s store offered weapons, furniture, antique fabrics, sacred art, archaeological relics, jewelry and goldwork. In 1903, Emanuele’s sons Rodolfo (1873-1958) and Carlo Subert bought the stores in Via Monte di Pietà and in Galleria Vittorio Emanuele II, and opened two others in Bellagio, at the time an elite international tourism destination, thanks partially to the presence there of a casino. When Carlo moved to the United States in 1910, Rodolfo changed the name of the stores to Rodolfo Subert Antichità e Belle Arti. It was probably at this time that a donation was made to the Museo Teatrale alla Scala di Milano consisting of an opera libretto bound in white satin and the Veduta dell’interno del Teatro di S. Benedetto di Venezia, both dating to the 18th century (Anonymus 1914). Like his father, Rodolfo was an important supplier to collectors and museums: in 1904 the Museo Poldi Pezzoli acquired a Parisian “libriccino d’ore” (Poldi Pezzoli 1981), and Frederick Stibbert, who would die the following year, acquired a helmet; Giuseppe Gianetti, an enthusiastic connoisseur of majolica, later acquired a great number of objects that would eventually become part of the collections of the homonymous museum in Saronno (Ausenda 1996). We also have documentation of several important purchases of majolica pottery in 1928 from the Galleria Vittorio Emanuele store. These objects are now kept in a number of Scottish national museums (Curnow 1992). Sources report that in 1940-41, the family made generous donations in the name of Rodolfo’s wife, Ambrogina Bergomi Subert, to major museums, including the Museo di Arti Applicate of Castello Sforzesco: “infrequent acquisitions [slowly] expanded the collection over the years, the most important of which was the donation by Ambrogina Bergomi Subert in 1941, which increased and enriched the collection of firearms with all the exemplars dating to the first half of the 19th century, thus providing exhaustive documentation of developments and changes during that period” (Allevi 1990). Rodolfo, together with several of his children, continued to run the store in Galleria Vittorio Emanuele II until July 1943, when bombardments destroyed the gallery and its entire contents, including an archive covering over eighty years of activity. Rodolfo’s oldest son (1898-1978), named after his father, was nicknamed “Duda” to avoid confusion. In 1926 he opened the Galleria S. Andrea in Via S. Andrea 11, where he continued to work until 1945 with his wife Gina Gandus (1900-1968). The store dealt in Italian art and had a particular predilection for jewelry and nineteenth-century Italian painting. In 1951, Duda Subert resumed the business, opening the store G. G. Subert in Via San Pietro all’Orto 26. The following year his son Alberto opened his own gallery in Via della Spiga 22. This is the period of the first antique shows, including the historic Biennali in Florence and an exhibition in Milan’s Palazzo Reale, featuring the participation of both stores. In 1996 the two businesses merged to create the Gallery of Antiquities and Art Objects in Via Santo Spirito 24, where Alberto Subert and his son Michele worked together until 2012. In 2013, Michele Subert, continuing the family tradition, opened a new gallery in Via della Spiga 42, where he focuses on 16th-19th-century Italian works, exercising particular care in selecting works for public and private collections.